eCabinet Systems version 6.0 Build 7 is now available. This latest version of eCabinet Systems is available as a download only. No disc is required. It is a full install. It will either update your existing version of eCabinet Systems or complete a full install. To obtain eCabinet Systems V6.0 Build 7, install click on the link above. Save this file to your computer then double click it to run. 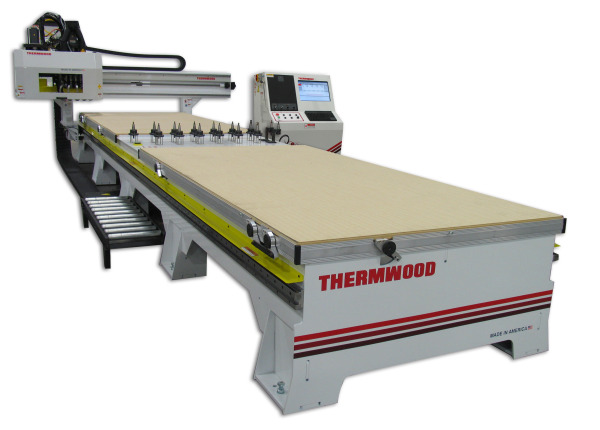 If you need a new reg code, please email cabinets@thermwood.com or go to www.ecabinetsystems.com to generate a new code. 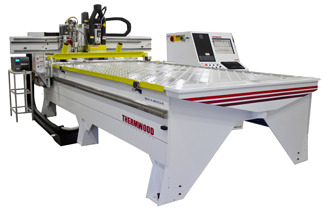 A CNC panel saw coupled with a machining center is the most common production arrangement for higher volume cabinet production. Nested based machining is more productive in lower volume shops but hasn't offered enough throughput for larger shops. Now there is a way to combine the best of both approaches to achieve even higher throughput and higher productivity. The idea is simple but the technology to achieve it has been elusive until now. 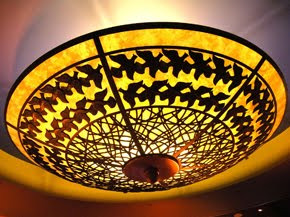 The basic approach is to use the panel saw to cut rectangular parts that do not require additional machining and use a CNC router to cut parts that require machining using a nested based approach. As simple as the idea sounds, it offers some significant benefits. You only need to cut parts on the panel saw that don't require additional machining. Less panel saw labor. You don't need to sort parts at the panel saw that need additional machining since they are not cut there. Even less labor. 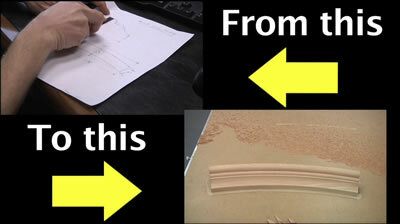 You don't need to transfer parts from the panel saw to the machining center. At the CNC router, you load full sheets of material instead of identifying, selecting programs, handling and setting up each part, one at a time. Much faster. During the machining cycle the operator has time to do other operations such as edge banding which is not possible if you are handling one part at a time. 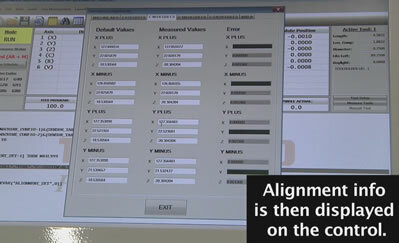 Automatically separate rectangular parts and send them to the optimizer and send all machined parts to the CNC router. Automatically nest the job at the machine control accommodating whatever material is available. Print nest diagrams and part labels at the machine control. Trim and bar code scrap for later use. Easily re-cut a damaged part or add it to the next job right at the machine. This approach offers more throughput, smoother operation with less labor and less chance for operator error and implementing it is rather easy. You will keep your panel saw, since our software will work with virtually any panel saw optimizer. 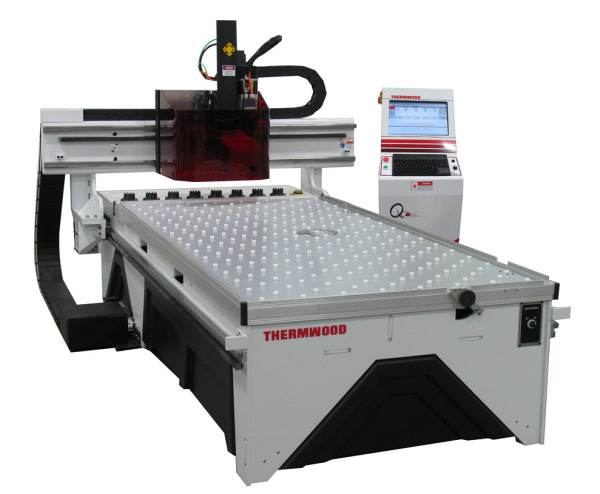 Replace your machining center with a CNC router. 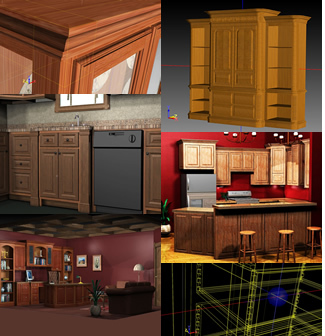 We will program your product line into our manufacturing software which will work directly with your existing cabinet sales software. That's it, you are ready to run. This approach is especially attractive if you need to replace your existing machining center. Our large table, nested based CNC systems are about the same price as traditional machining centers but, are a lot more productive and offer better throughput.